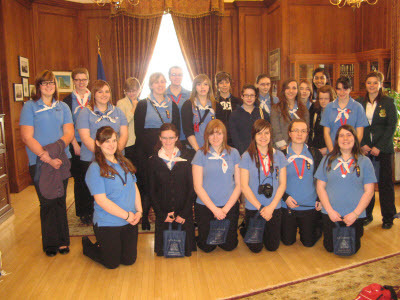 Earlier this spring, Girl Guides in Alberta got a glimpse of political life during the 40th annual Alberta Girls’ Parliament. The parliament is a hands-on way for girls to get a realistic view of life in the political trenches. During the weekend event, they elected opposition leaders, a Speaker and then rolled up their sleeves and got down and dirty with some serious parliamentary debates. At this year’s Girls’ Parliament, the Pathfinders and Rangers debated weighty subjects such as organ donations, free-range livestock and sexual health education for teens. Among the guest speakers was Alberta MLA Rachel Notley (whose daughter is a Guide), sharing her own experiences of the role of women in politics. Here’s hoping that as more and more young women become engaged in the political process, we’ll start some more favourable statistics. Have a comment about this post? Click the link “Leave a Comment” or “Comments“. We’d love to hear from you! Likewise, share this email with a friend! You’d be helping GGC spread its message! This entry was posted in Awesome Activities and tagged Alberta Girls Parliament, civics, election, vote. Bookmark the permalink.